Town boss Steven Pressley says Town will learn from their 5-0 defeat to the hands of Premier League side Liverpool. Pressley’s men were 1-0 down at half-time to Marko Grujic’s debut goal. But the Reds proved their Premier pedigree in the second 45 as Ben Woodburn, Lucas Leiva and Roberto Firmino (two) scored against Pressley’s fresh, young inexperienced 11. 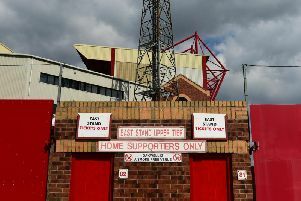 But the ex-Scotland defender was not downbeat after their opening pre-season defeat and says there are positives to take and Town’s fitness levels were tested as they build towards the opening League One game at Northampton on August 6. He said: “First half I was impressed with some aspects of play, second half we know we have to do better but for our first game I thought it was a great exercise. “Generally in your first game of pre-season you don’t come up against the likes of Liverpool, you have to build towards these sort of games so great exposure for us, a really good learning curve and I think we got a lot of fitness out of the game. “I thought it was a great exercise for us – it shows why there are leagues in football, they worked us extremely hard, which is what we wanted to get out of the game. “We don’t want to lose games of football but for us it is all about building towards August 6. Youngsters Akil Wright, Keano Deacon, Nick Haughton, Ash Hunter, Jack Sowerby and new young signings Ashley Nadesan and Elliot Osborne all got 45 minutes under their belt. Wright gave away a first-half penalty that Liverpool’s experienced striker Danny Ings fired straight at new keeper Chris Neal. Pressley says it was great exposure for the young guns to get a real taste of first team high-tempo football but says the squad still has a long way to go before August 6. “It is a great exposure for (the young players) and the one thing it tells us is that we have got a long way to go, that is football, that is why there are leagues and that is why you have to aspire to continuously improve.